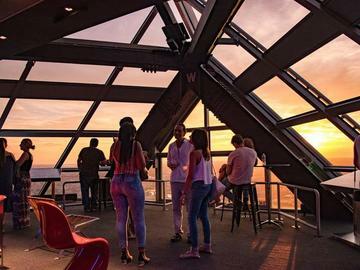 One Liberty Observation Deck is thrilled to partner with the DVLF to host the official OUR NIGHT OUT event for the month of June. Join us on on Tuesday, June 26th from 6 - 9PM on the 57th floor of One Liberty Place for a special Pride-Themed BAR 57 happy hour. Enjoy special pop up performances (to be announced), light bites and a cash bar by Schulson Catering from the top of Philadelphia. A portion of proceeds from tickets will be donated to Philadelphia Black Pride. Online Tickets are SOLD OUT for tomorrow's event. Limited tickets will be available onsite at the admission's desk for $14.50. Capacity is limited. Tickets purchases in advance are gaurenteed admission. Tickets purchased at the door are $14.50. First come, first served.